The rate of technological progress, as well as its geographical pattern, is a function of population size, its average IQ and distribution, and “technology of technology” (e.g. literacy). The mere maintenance of any given technological level requires a certain amount of cognitive capital, and problems that need to be solved tend to become harder as we ascend the tech tree. Consequently, there is a race between the capacity to generate new technology – e.g., via population growth thanks to technology increasing carrying capacity; technological growth itself as it translates into “technology of technology”; and increases in average IQ (e.g. Clark-Unz selection; Flynn Effect; maybe machine superintelligence, someday) – and the innate tendency of technological growth to dissipate over time as the problems that need to be solved for it to continue become inexorably harder. If this theory of technological growth is true, this has huge consequences for the 21st century. Will we be able to achieve radical technological breakthroughs that will enable an “intelligence explosion” before dysgenic trends in reproduction foreclose that possibility for the next few centuries? Arthur H. Jensen (The g Factor) comprehensively established the validity of g, and Charles Murray (The Bell Curve) connected psychometrics with sociology – higher IQ people tend to be more successful. Richard Lynn, Heiner Rindermann (Cognitive Capitalism), Dmitry Ushakov, Garett Jones (Hive Mind) established that IQ and multiple facets of national wellbeing, including GDP per capita, are very closely linked, and that the causality primarily goes from the former to the latter. Finally, the cliodynamicians, such as Andrey Korotayev, Sergey Nefedov, and Peter Turchin, established that history follows laws, and can be mathematically modeled, like economics. (Obviously this is just a barebones sketch, since there are many other people and ideas involved). 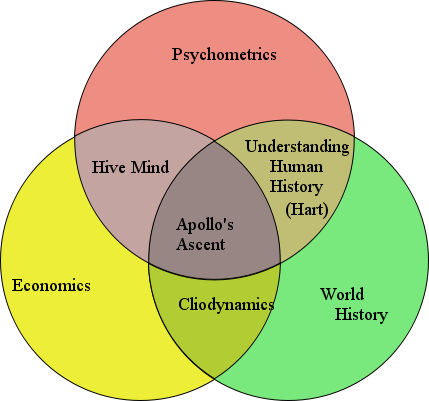 How does the theory of Apollo’s Ascent fit into this? 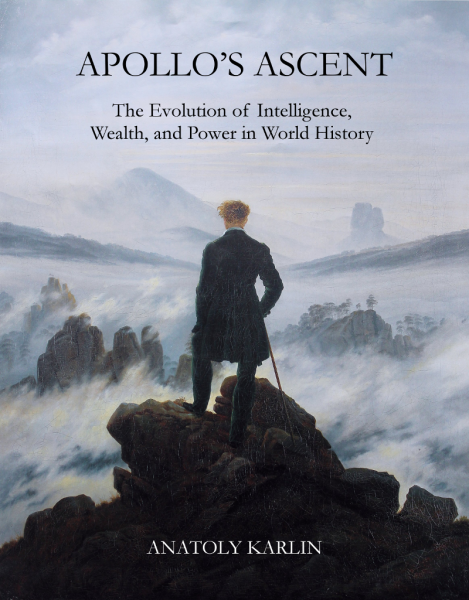 An IQ-centric theory of world history has already been attempted by Michael Hart in Understanding Human History, but too often one gets the impression from all historical puzzles are a nail to the psychometric hammer. The cliodynamicists have produced really great work, the psychohistorians of our world, have produced some really great work, but are constrained by psychometric blank slatism. Finally, while the work of the “cognitive capitalists” is also brilliant and groundbreaking, it would certainly behove them to extend it into the deep past – and the future. This is something I will be gradually working towards in the next decade(s), as free time and resources permit.